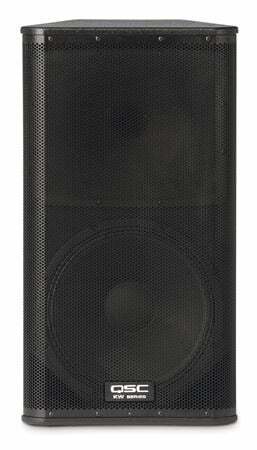 Exclusive 12, 8, 5 or 3 Easy Payments on QSC KW152 15 Inch 1000 Watt Two Way Active Powered PA Loudspeaker only at AMS! Free 2 Day Shipping & Free Extended Warranty. Call our Gear Experts at 800-319-9043 for expert advice! 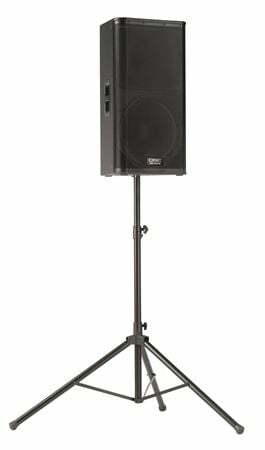 The QSC KW152 Loudspeaker is a 15 inch, 1000 watt powered PA speaker. 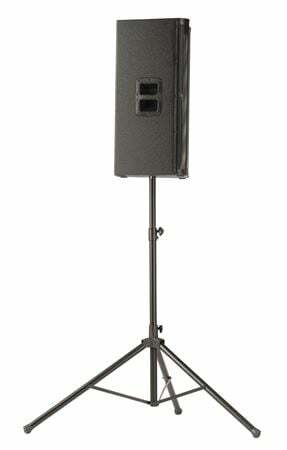 Featuring tour-grade 16 gauge steel grilles, the KW152 loudspeaker is made to withstand the wear of the road. 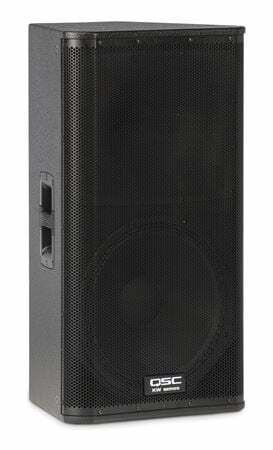 The QSC KW Series represents the next evolutionary step in wood enclosure loudspeakers. QSC's system engineers have created the KW Series to feature groundbreaking electronic attributes while at the same time designing a product that is both smaller and significantly lighter than previous wood enclosure models. 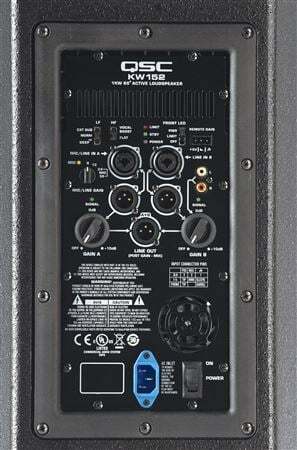 High Output: Each of the four KW Series models features a QSC designed, 1000 watt (2 x 500) Class D power module. And continuing in the K Series tradition, every model is fitted with the identical high-output 1.75 inch HF device (full-range models) and woofers of the same high quality design, regardless of speaker size. Defined Coverage Area: Directivity Matched Transition (DMT) provides for matched LF and HF coverage across the entire listening area, eliminating unnatural dead or hot frequency zones. DSP: Extensive signal processing is employed throughout, providing levels of sonic clarity and total output that defy all expectations for a product in this category. Connectivity: KW Series features a four-position mic / line gain switch that allows for connection of a wide variety of devices. Combo XLR and 1/4 inch TRS inputs accept both mic and line level input while a set of RCA phono inputs (except KW181) allow additional connectivity to portable MP3 players, CD players and line-level mixers. Up to three audio sources can be mixed internally and summed to a balanced output for daisy-chaining of multiple units. Separate direct outputs are also provided on each channel for additional output flexibility. Control: On-board switches provide preset EQ settings. The HF setting (full-range models) can be set to VOCAL BOOST for additional presence in the critical mid-frequency area or FLAT for accurate reproduction of the incoming signal. The LF switch can be set to NORM, DEEP for additional bass extension, or EXT SUB (full-range models) for use with an external subwoofer. The rear panel LED switch can be set to POWER, illuminating the front-mounted LED when the unit is powered on, OFF for applications where it is not desirable to illuminate the front LED, or LIMIT which indicates to the system operator that the clip limiter circuit has been engaged during operation. Tilt-Direct: The KW152 features a unique Tilt-Direct pole cup mounting system. A simple turn of the dial engages a 7.5 degree downward tilt of the speaker allowing acoustic energy to be kept on the audience and off reflective surfaces for applications where maximum coverage from a high-positioned speaker is desired. Remote Gain: Remote gain control capability is offered via a potentiometer (not included) connected to the on-board Phoenix-Style connector. In an installed application, multiple KW Series speakers can be daisy-chained for total gain control from a single remote pot. Auto-standby mode is engaged after 5 minutes of inactivity. Premium-grade materials: KW Series is designed to withstand the rigors of professional use. Advanced construction processes, premium-grade Baltic birch cabinetry, ergonomic, cast aluminum handles, and a highly protective steel grille provide for ease of transport and long term durability. Wobble free connection to a threaded speaker pole (included). Great item for Djs looking to complete your KW series. Love this item. Great product gets the job done hands down! 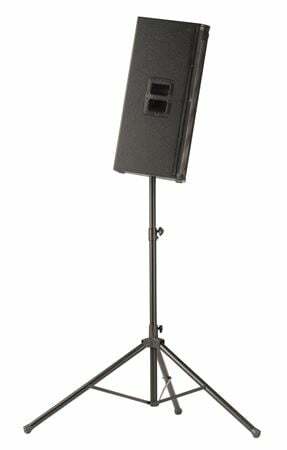 Always been and always will be a fan of QSC speakers. This product meet all expectations, and then some! Not only would I continue shopping here, but I will refer American Musical to my friends as well!! Great set of speakers. When ypu pair them with a subwoofer they kick even harder. Love them. Very loud and excellent performance. Well worth the money!